For most people, the best can opener is the EZ-DUZ-IT, an American-made version of a classic that's been found in kitchens for generation. It's cheap, durable and just works, period. We also found some great electric can openers, including an under-cabinet model that frees up valuable counter space, and some sturdy jar openers, too. 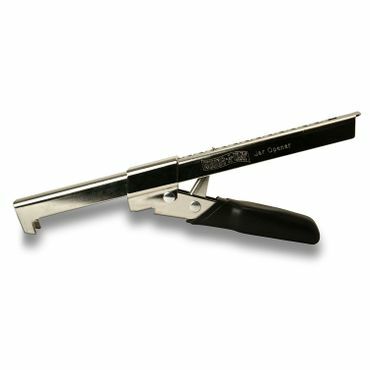 Specs that Matter Side cut or top cut – Top cut Manual or electric – Manual Dimensions – 2.1" x 1.9" x 7.2"
The EZ-DUZ-IT Deluxe Can Opener uses a classic design that's been found in American kitchens for generations. It's a no-frills option, but owners say you can count on a comfortable grip, easy-turn handle and years of no-hassle can opening. Made in the U.S., feedback indicates that the EZ-DUZ-IT is both heavier and sturdier than the can opener it's based on, the now made-in-China Swing-A-Way. 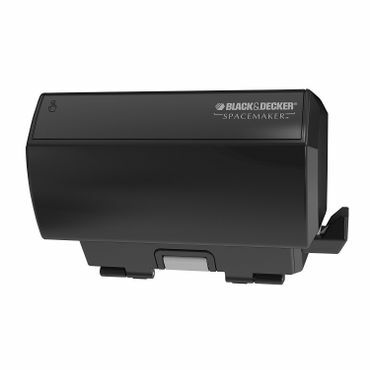 Specs that Matter Side cut or top cut – Top cut Manual or electric – Electric Dimensions – 7.5" x 6.5" x 5"
The Black & Decker Spacemaker Under-the-Cabinet Can Opener tucks snugly underneath a wall cabinet, off the counter and out of your way. This top-cut electric can opener holds the can by itself, and it automatically stops when the can is open. 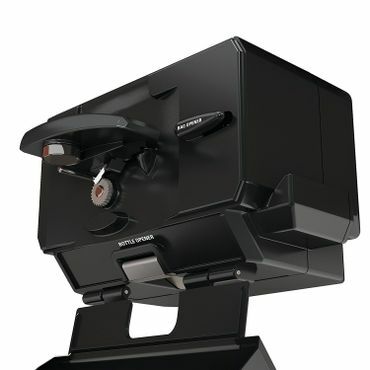 It includes an on-board bottle opener, knife sharpener and bag cutter, with a flip-down door that neatly hides it all. Specs that Matter Side cut or top cut – N/A Manual or electric – Manual Dimensions – 4" x 1" x 9"
The handheld Swing-A-Way Comfort Grip Jar Opener doesn't take up much drawer space, and it doesn't require much grip strength either. Owners say it's perfect for people with arthritis. It adjusts to fit almost any sized metal or plastic jar lid -- from 0.5 inch to 4.5 inches in diameter -- and its all-metal construction makes the Swing-A-Way Comfort Grip a better bet than plastic jar openers. 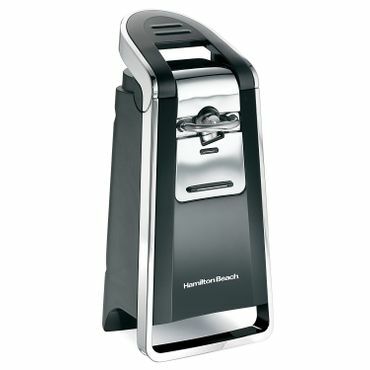 Specs that Matter Side cut or top cut – Side cut Manual or electric – Electric Dimensions – 10.2" x 4.7" x 5"
Unlike most electric can openers, the Hamilton Beach SmoothTouch 76606ZA cuts around the side of the can -- leaving smooth edges on both can and lid, and never letting the blade (or the possibly germy lid) touch the food. That means no cleaning a gunky blade, and no cut fingers. The Hamilton Beach opens both large and small cans with ease. Its compact black-and-chrome body looks good, too, reviewers say. Can openers come in many styles, from the nearly effortless electric models to the tried-and-true hand-crank models that work just as well today as they did in decades past. The best can and jar openers can handle a wide variety of can or lid shapes and sizes without jamming, cutting your fingers or requiring a lot of hand strength. From models that are little changed from the ones your grandparents and even great grandparents used, to modern devices that offer improved safety and convenience, manual can openers remain the most popular choice. Most are easy to use and reliable, but some level of manual strength and dexterity are required. Jar openers are tools that either clamp or slide onto the jar lid, providing extra leverage to help you get the jar open. Most jar openers require some (minimal) hand and wrist strength, but owners find they're still a big help for those with arthritis or limited grip strength. Once exceedingly popular, under-cabinet and under-counter can openers are not as common in kitchens now. However, they still remain a great choice if you don't want to lose any drawer or counter space to your can opener. Electric can openers reduce the process of opening a can to the flip of a lever or push of a button. Though they can take up a bit of counter space (space-saving under-cabinet models are also available), electric can openers are especially helpful if you have limited hand strength. Some will even stop automatically once they've completed the cut. Can openers can be top cut or side cut, and each type has its pros and cons. Many of us have learned to accept the risk of sharp, jagged edges when opening metal cans with a top cut opener, but side-cut (also called smooth-edge) can openers change that by cutting along the side of the lid, splitting the seam where it joins the can and leaving smooth edges on both pieces. 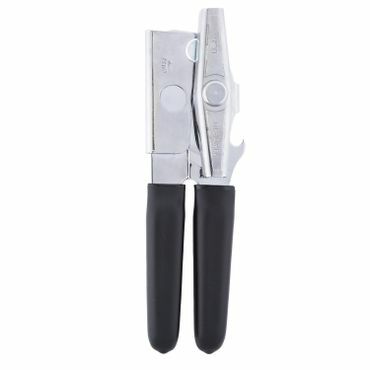 Safer than traditional top-cutting models, smooth-edge can openers are popular with parents of small children. They're also a great choice if you're buying for an elderly member of the family, or are just tired of fishing top-cut can lids out of your food -- a side-cut lid will not fit into the body of the can (although some top-cut models are equipped with magnets to keep the cut lid from falling down into your food). Plus, a side-cut can opener's cutting teeth never actually contact the food, so they're more sanitary, rarely need to be washed (according to users), and are thus much less likely to rust than their top-cut competitors. But smooth-edge can openers still aren't perfect. Because they don't leave an obvious separation, it can be hard to tell when you've cut all the way around, and if you cut around more than once, you risk creating sharp metal slivers that can get into your food or cut your fingers. Durability is a continuing issue with smooth-edge can openers as well, and getting the lid off is sometimes a challenge. Some side-cut openers come with tiny pliers to help you grasp the lid and pull it off. Owners occasionally complain about the cutting blade of their smooth-edge opener dulling over time, requiring them to circle the can more than once, which, as noted above, creates metal slivers. Those issues and others lead Wirecutter to stop recommending manual side-cut can openers, though its top electric can opener is a side cut model. It seems like everybody's frustrated with dud can openers, searching eagerly for one that will just work. We found plenty of expert tests, choosing only the most recent and scientific ones for this report. Wirecutter conducts the most thorough, up-to-date tests of manual and electric can openers. Cook's Illustrated and Consumer Reports are trusted sources for kitchen gadget tests (and Cook's Illustrated conducts the best jar opener test we found), but they haven't tested any new can openers in the past few years. Fine Cooking magazine, The Wall Street Journal, Chicago Tribune and the bloggers at AnnaAndKristina.com get in on the act, staging their own head-to-head can opener battles. Owner reviews fill in the rest of the picture, providing important information on how a can opener works in real life, and over the long haul as some models have been around seemingly forever and have amassed thousands of reviews over the years. We look to sites like Amazon and Walmart for that feedback.